On 11/4, I attended the award ceremony of the Quick Scallop Recipe Contest held in Hokkaido. 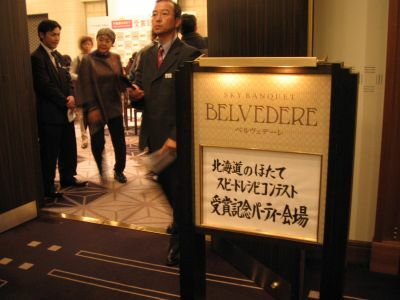 The ceremony was held at Hotel Monterey Edelhof Sapporo. With Gutch Yuzo (who is a singer, entertainer, and cook), there was a talk show, and many fans gathered. It was a lavish party! 10 winners were selected out of 372 entries nationwide and invited to the party! Gutch Yuzo gave us the prize one by one with his comments. At the ceremony, we were able to try out all the award winning recipes recreated by the hotel chefs! We had a good time. Surprisingly, there were 2 winners who we knew each other since the other contests in the past!!! Anyway, my schedule was pretty tough. I had to work in the morning of 11/4 and in the afternoon of 11/5, so I left my office at noon and came back at noon of the next day! Unfortunately, we were not allowed to take a pictures during the ceremony, so I will post the pics later when I received from the organizer!